'Legend of Korra: Turf Wars' (Part One) is a good character study on young women going through a turbulent time in their lives – AiPT! Overall, this is a good character study on young women going through a turbulent time in their lives, that has a little bit of an ‘Avatar’ story tacked onto it. At its best, the Legend of Korra shook off the stigma of its “Young Adult” label and proved to be a compelling anime adventure that provided young people from all walks of life with heroes they can relate to and root for. While the themes of family, friendship and self discovery can apply to literally anyone, the series (and to an extent, its predecessor Avatar: The Last Airbender) was particularly important to young people of color and those of differing sexualities. That latter point, which I personally felt was handled rather subtly, proved to be a big point of contention for opponents of the show and a rallying point for its defenders. That Korra’s evident bisexuality was only touched on in the last scene (the last shot even) of the series’ final episode naturally incensed both sides of the debate, but truly proved to be the most diplomatic way for the show’s creators to tackle the issue on a cable channel aimed at the 12-and-under crowd. Now that the series has wrapped and the Legend of Korra will live on in a series of comics for Dark Horse, series co-creator Michael Dante DiMartino is through being ambiguous. 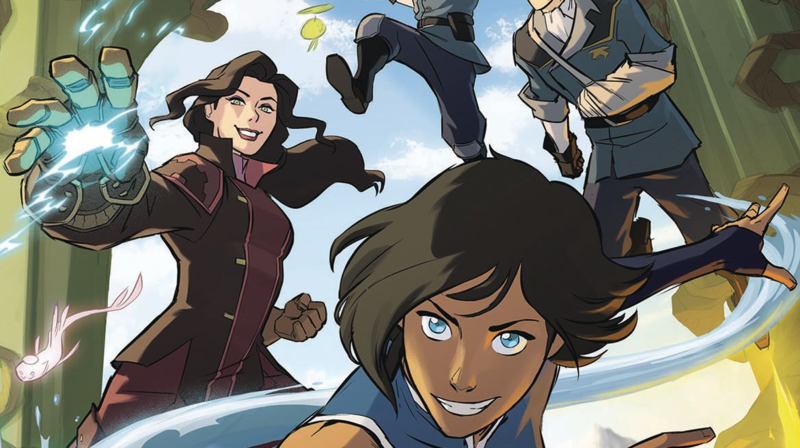 Indeed the book’s first arc, dubbed “Turf Wars: Part One”, picks up right where the TV series left off – removing any doubt that the knowing look and briefly held hands of the show’s finale were signs of anything besides a romantic relationship between the titular Korra and her companion Asami. The first several pages follow our heroines as they enjoy each other’s company on a journey through the spirit realm. They swim, play, canoodle – and yes, even kiss – and honestly, if parents are willing to raise their kids with a respect for other people’s lifestyles (you know, like good human beings) there’s nothing too shocking or upsetting in this book. Yes two young women kiss, but it’s far from oversexualized and reads just as genuinely as any heterosexual teen romance you’ll read out there. It honestly feels like DiMartino, who wrote this book, felt he had to address the mild controversy that came out of the series’ finale head on, because he sends about ⅔ of the initial arc specifically on the Korra/Asami relationship. We join our heroines on their vacation in the Spirit World. The second, and probably most culturally important portion of the story deals with Korra returning to her family’s home at the Northern Water Tribe to tell her parents about her new relationship. Indeed, so much of this book is about coming out – something I’m sure will help younger kids deal with their own uncertainty, but as a cisgendered straight male I’m something on the outside of this. From a critical standpoint I could find issue with literally every person they share their news with (barring maybe Mako, who has dated both women) reacting to the news with overwhelming positivity, but this is a fantasy series that is at least partly built around providing positive depictions of social groups that are typically ill represented in modern fiction, so I’m okay with the re-incarnated elemental wizard and her girlfriend having a sound support structure of friends and family because of the positive message it sends. Yes there are some misunderstandings between Korra and her father, but it comes from a place of familial care and concern rather than anything negative. Korra realistically reacts to this perceived negativity like a teenager might – jumping to conclusions and a “parents just don’t understand” mentality. Again, I’m not the audience for this, but I recognize consistent scripting. With the heavy lifting of the emotional side covered (though the two women do experience some relationship issues throughout this story, it’s nothing too dissimilar to issues she faced while dating Mako), the rest of the book falls into pretty familiar territory for the LoK series. A crooked politician in Republic City is employing local Triad gangs to create havoc for one goal or another. This time around that includes instigating hostilities between the human and spirit worlds, which is what catches the attention of Korra and the team. It all feels very reverential from the show, which is both a blessing and a curse. Unlike the original Avatar series, which was given room to breathe and develop its storylines across a full 4 seasons, Korra always felt rushed. For whatever reason, Nickelodeon was far more reticent to run with the (fairly popular) series than its other programs, and the writers were forced to move at a far more hectic pace. The end result is a less developed story and events that happen with little build. That shouldn’t suggest that Korra is a bad show, far from it actually. It’s just that the rigors of working AGAINST the producers at Nickelodeon rather than with them, led the creators to treat each season as if it could be their last. This is why each season was treated as its own unique arc, and why Aman was so underdeveloped as an antagonist in the first season (as they had to establish Team Avatar and a ton of lore, meaning the villain ended up a little flat). This book continues these pacing issues. While it’s understandable why most of the trade is dedicated (in one way or the other) to the development of Korra and Asami’s relationship, as creating a positive image of a queer POC in a fantasy series popular with kids is obviously a momentous and important task, it does mean the arguable “plot” of the series becomes underdeveloped. There’s a new leader of the triads (using blades that are a curious throwback to Avatar’s ill-fated revolutionary Jet for some reason) and another corrupt politician seeking to use the Avatar’s powers/influence to suit his own purposes, but their collusion is only briefly touched on. Even then, they use the climactic battle between the triads and the combo off Team Avatar and the Air Nomads as a means of revealing the Korra-Asami relationship to the rest of the supporting cast. There is a bit of a cliffhanger as the Triad leader is somehow merged with spirits at the end, but it’s not anything that will rock your world too much one way or the other. Overall, this is a good character study on young women going through a turbulent time in their lives, that has a little bit of an Avatar story tacked onto it. The art is consistent with the show, as are the character voices, it’s just that the story here is the character interactions surrounding Korra’s newfound relationship, not the action-oriented fantasy that the series is known for. Not to say that’s a bad thing, per se, but it’s something readers should know going into the book. I imagine volume 2 will be back to the familiar adventures lovers of the show will remember so fondly, Book 1, however, is a character piece on young love and the coming out process. As a musing on the difficulty of coming out to one's friends and family, the book is a pretty solid read. As an adventure in the Avatar universe, it's considerably less successful. The art and tone is all very consistent with the show. Purposefully tackles the controversial ending of the TV series in a way that will speak to the intended audience without talking down to them. The B story is so ill developed that it feels unnecessary and almost distracting to the real goal of this book.